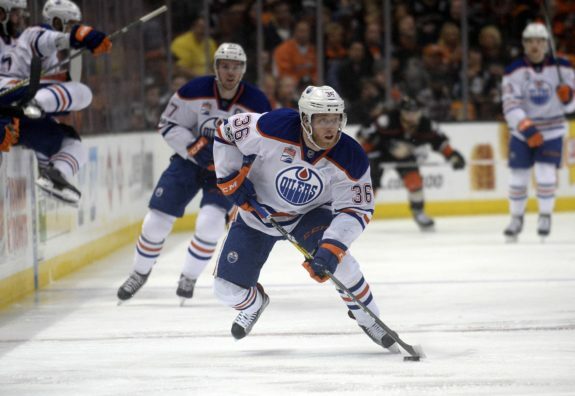 Yesterday we reviewed the trade value of the Edmonton Oilers’ goalies and defensemen. This time we’re going to look at the forwards and whose value has increased, decreased or stayed the same since last year. 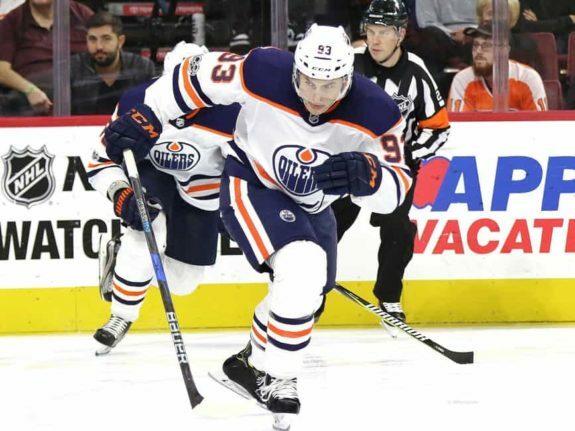 It’s no secret Oilers general manager Peter Chiarelli has one major task to accomplish this summer – find a scoring winger to play with Connor McDavid. Edmonton has moved out three scoring wingers (Taylor Hall, Jordan Eberle, and Patrick Maroon) over the past two seasons. The remaining group of Milan Lucic, Jesse Puljujarvi, Drake Caggiula, Pontus Aberg, and Mike Cammalleri haven’t provided a consistent answer. Oilers head coach Todd McLellan is now trying Ryan Nugent-Hopkins in that spot next to McDavid. If that doesn’t work out, they’ll need to find someone. So what is the trade value for each of the Oilers forwards? For this exercise, we’ll use an up, down, or equal model that’ll compare to where these players were a year ago. For fans wondering what valuable assets the Oilers have that could fetch a return, maybe this will paint a picture as to what Edmonton’s working with. So, what’s the trade value of Edmonton’s current roster players? In the second part of this series, let’s take a look at the forward group. A green arrow pointing upwards means the player’s value has increased. A red arrow pointing downwards means the player’s value has decreased. A blue line indicates their value is the same as last season. Leon Draisaitl (▲) – It took a little while for Draisaitl to get going this season due to some early-season concussion problems, but he’s turned a corner. The 22-year-old has 22 goals and 61 points in 65 games. He’s on pace to finish with 74 points, which is close to the 77 he scored last year. Draisaitl hasn’t been held off the scoresheet in consecutive games since early January. Since then he’s amassed 29 points in 28 games and has returned to the dominant player he was last year. Related: Milan Lucic’s Value at Rock Bottom? Milan Lucic (▼) – THW’s Kyle Gipe was right when he listed Lucic’s contract as Edmonton’s worst deal on the books. The 29-year-old is in year two of seven on that deal and his production is already on the decline. After scoring 23 goals and 50 points last season, he’s on pace for just 39 points in 2017-18. The Oilers can’t pay someone $6 million for that kind of production. What’s worse is that his contract has a no movement clause (NMC), and a modified no-trade clause (NTC) in the final two years. His value is at rock bottom. Connor McDavid (▲) – McDavid is the franchise building block in Edmonton, and he’s arguably the best player in the game. It’s not fathomable that they’d trade the phenom, but if for some hookey reason they did, the Oilers would get the farm and then some! He’s on this list only because of formalities. He’s not getting traded! McDavid’s on a torrid pace to finish the year with 18 goals in his last 20 games. He’s only four points back of Nikita Kucherov for the NHL scoring lead. McDavid’s on pace for 40 goals and 102 points. Ryan Nugent-Hopkins (▲) – Before his injury, Nugent-Hopkins had developed another aspect of his game – scoring goals. With 18 goals in 51 games, RNH was flirting with potentially scoring 30 goals this season. Even after missing 18 games, RNH is still third in team scoring with 35 points. He’s made improvements on faceoffs as well and this season’s 48.6% is higher than his career average of 43.8%. 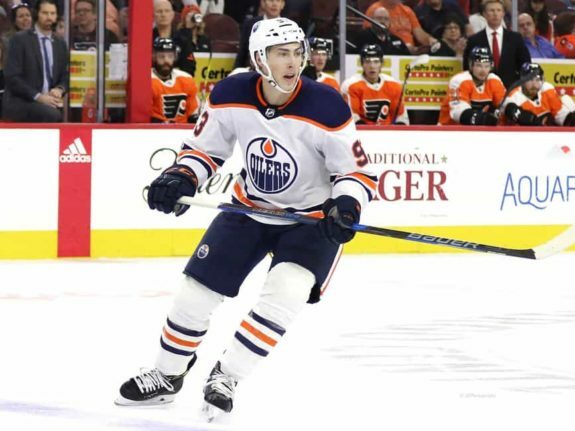 Now that he’s finally getting a look as a winger next to McDavid, Edmonton might finally unlock RNH’s full offensive potential. Jesse Puljujarvi (▲) – The 19-year-old has already scored 11 goals in 52 games this season. That translates to a respectable 17 goals over a full 82-game schedule – not bad for a teenager. McLellan has him playing on the third line, allowing him to develop his offense further. He’s no longer playing against the opposition’s best defense pairings, and he’s producing shots better than he did a year ago. He’s averaging 13:37 in ice-time and has increased his shots-per-game from 1.46 to 2.17. Value is rising. Ryan Strome (▼) – Believe it or not, Strome’s had a respectable year. The reason his value is down is to emphasize that he won’t fetch a Jordan Eberle-type player in return. It took the 24-year-old some time to find his role, but he’s found comfort in the third-line center spot. Puljujarvi and Strome might be playing on the third-line, but the two are in those roles to help balance the lineup. Strome’s 31 points this season are better than his totals in his last two years with the New York Islanders. He’s on pace to finish with 37 points. Pontus Aberg (–) – Aberg is a new addition, so he gets some time to establish his value with his new team. His possession stats have been average despite getting a 53-47 split favoring offensive zone starts. It’s been a mixed bag of results for the 24-year-old. He is shooting the puck quite consistently (averaging two shots per game), but still hasn’t scored and has just one assist in seven games. His 14:10 in ice-time ranks seventh amongst Edmonton’s forward group. The jury’s still out on Aberg. 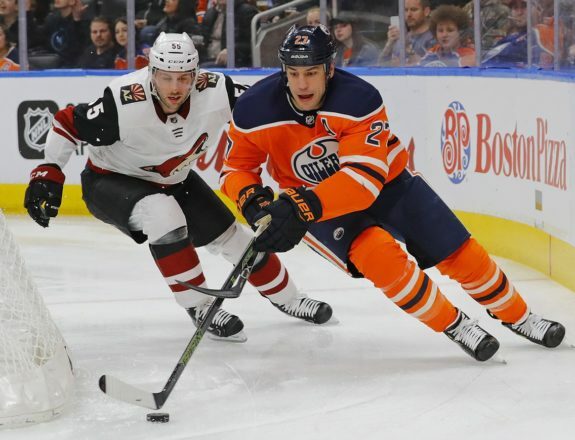 Drake Caggiula (▼) – When Chiarelli decided to stay pat last summer and not acquire another scoring winger, it was because he had faith in two players. One of them was Caggiula who played in the top-six during the playoffs last year. This season he has just eight goals and 14 points in 54 games. Ideally, Caggiula is a top-nine forward who can play up and down the lineup. It just hasn’t come to fruition this season though. Caggiula also has just one goal in his last 17 games. Mike Cammalleri (▼) – There’s a split amongst fans whether the Oilers should bring back Cammalleri next season. He’s what he is at this point of his NHL career, and has been a frequent healthy scratch for Edmonton. A pending UFA, Cammalleri has five goals and 27 points in 60 games. He’s also one of the worst Oilers from a possession stats perspective. The 35-year-old will likely walk via free agency this summer. Zack Kassian (▼) – Despite already equaling last year’s goal total (seven), Kassian hasn’t exactly been the same player he was last year. Far too often he’s not as physically engaged as he was in 2016-17. He’s drawn criticism this year for his play on the penalty kill and id not doing enough to get into lanes and block shots. He’s been a healthy scratch a handful of times this season as well. His ice-time has been cut down to just 11:37 per game. Last year he threw 201 hits, this season he’s thrown just 124. Jujhar Khaira (▲) – Probably one of the brightest stories of the season has been Khaira’s evolution. 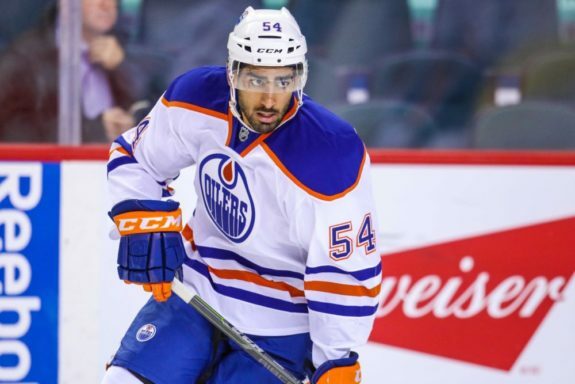 The knock on Khaira was that he wasn’t consistent enough to warrant being an NHL regular. This season he’s blown the roof off of expectations and has arguably been Edmonton’s best bottom-six forward. There’s a lot of speculation he centers the fourth-line, but don’t rule him out as a third-line winger. With 19 points in 56 games this season (and 22 in his career), Khaira is the second-highest scoring Punjabi player in NHL history. Iiro Pakarinen (▼) – The 26-year-old missed quite a bit of time last year due to injuries. He got a one-year “show me” deal from the Oilers, but has been a frequent healthy scratch, and even spent 18 games in the AHL this season. When he has played, Pakarinen has toiled on Edmonton’s fourth-line but hasn’t solidified himself as an NHL regular. Pakarinen has three points in 32 games and is averaging 10:13 in ice-time when he does play. No other Oilers forward (with a minimum of ten games) has averaged fewer minutes. Anton Slepyshev (▼) – Slepyshev had a great playoff performance last spring, but an off-season training injury hindered his progress in 2017-18. He battled through various injuries through the first half of the season, got sent to the minors for a game, and was scratched a few times. There were rumblings the Oilers were shopping him at one point. The situation has settled itself down, and the Russian forward seems to have found some chemistry with Puljujarvi and Strome. A healthy Slepyshev should produce more next year.